There were two Boy Scout rockets fired on April 27, 1960. The rockets were launched at Raeren, Belgium. One was the Dan Beard rocket and one was the Baden-Powell II rocket. The cachet (round one on left of cover as you look at it) identifies which rocket the cover was flown in. 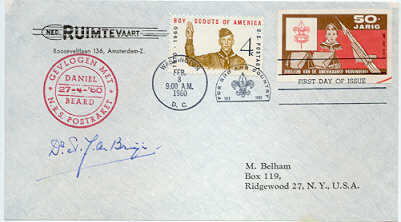 There were a total of 725 covers flown on the Dan Beard, including 190 Boy Scout FDCs from the US dated 8 February 1960. The flown covers were signed by Dr. de Bruijn. 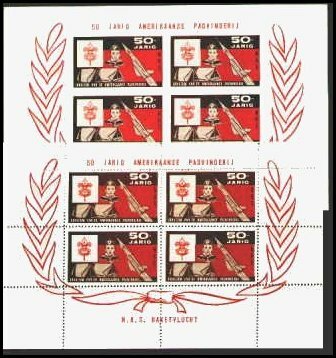 The Scout local issue rocket stamp in the upper right corner were both perforate and imperforate and printed in sheets of four. The American Airmail Society, Cinnaminson, New Jersey 1986.